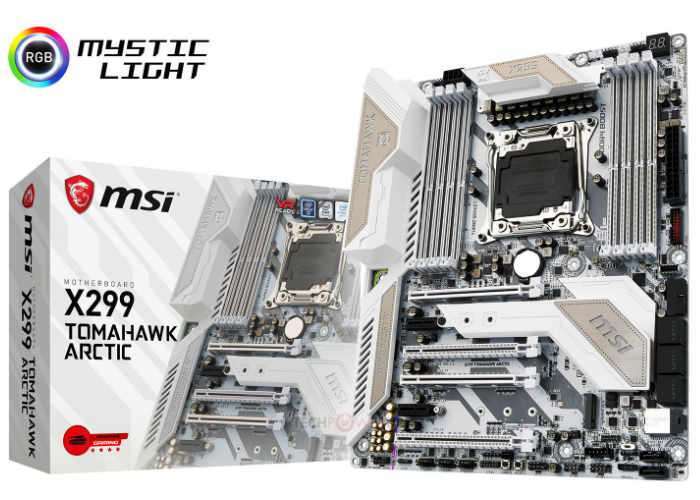 MSI has unveiled a new addition to their range of motherboards over the weekend with the launch of the MSI X299 Tomahawk Arctic Motherboard which offers an almost identical variation on the popular X299 Tomahawk motherboard. The MSI X299 Tomahawk Arctic Motherboard if finished with a white PCB with grey stripes that continue over the VRM heatsinks and rear I/O shroud as well as the PCI-Express slots and eight DDR4 DIMM slots. The X299 Tomahawk Arctic is a bustling metropolis which draws power from a single 8-pin EPS connector besides 24-pin ATX. The board features a 9-phase CPU VRM, and 4-phase memory. The CPU socket is wired to eight DDR4 DIMM slots, and four PCIe 3.0 x16 (x16/NC/x16/NC or x16/NC/x8/x8 or x8/x8/x8/x8 with 44-lane CPUs; x16/NC/NC/NC or x8/NC/x8/x4 with 28-lane CPUs). The first and third slots feature metal reinforcement. Storage connectivity includes two 32 Gb/s M.2 slots, a 32 Gb/s U.2 port, and eight SATA 6 Gb/s ports. Networking is care of a single GbE connection driven by Intel i219-V controller. The onboard audio solution combines a Realtek ALC1150 (up to 115 dBA SNR) CODEC with audio-grade capacitors, and ground-layer isolation. Unfortunately no information on pricing or worldwide availability has been released as yet by MSI, but as soon as information comes to light we will keep you updated as always. Jump over to the official MSI website for more details ahead of its availability.